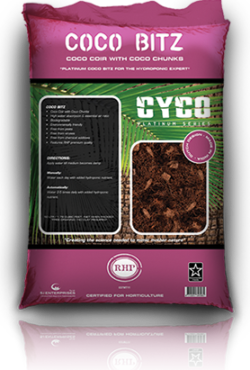 Cyco Coco Bitz is a mixture of Coco Coir and Chunk Coir which provides superior aeration and drainage qualities with no additional amendments of perlite. 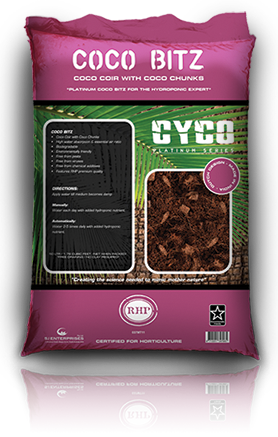 With a base of Coco Coir fibers, larger chunks of coconut coir based material is then added resulting in a medium removing the need for perlite while ensuring continued aeration with no migration of the perlite to the top of the medium during use. 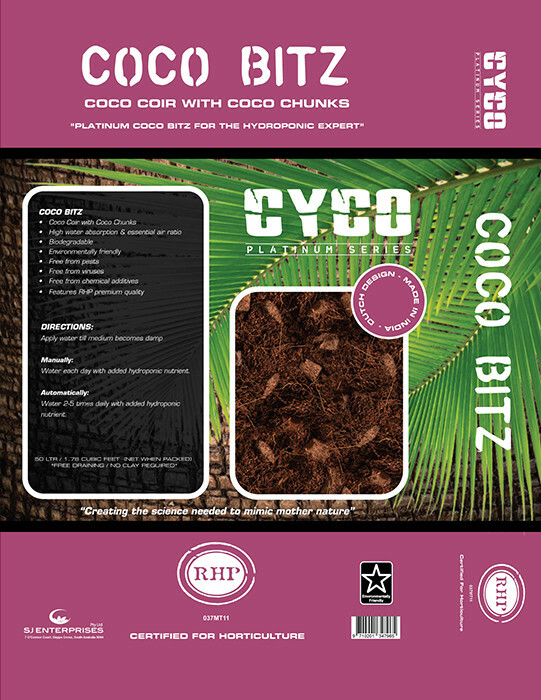 Cyco Coco Bitz maintains the RHP Dutch Standard of quality for horticultural substrates which ensures a constantly high level of quality assurance for consistently exceptional results. Only the most premium of Coco Coir based products may be eligible to carry the RHP Certification ensuring a medium free of diseases, pathogens, and guaranteed consistency of the Coco Coir makeup. High water absorption & heightened aeration. Contains a mixture of Coco fiber and Coco fiber chunks. 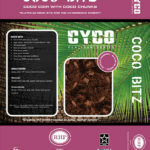 Description: Cyco Coco Bitz is a mixture of Coco Coir and Chunk Coir which provides superior aeration and drainage qualities with no additional amendments of perlite. With a base of Coco Coir fibers, larger chunks of coconut coir based material is then added resulting in a medium removing the need for perlite while ensuring continued aeration with no migration of the perlite to the top of the medium during use.